AMD AMD4/AM3 / AM3 / AM2 / FM2 / FM2 / FM1 socket. 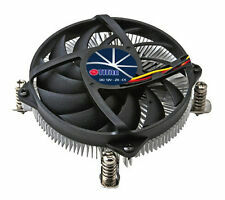 RGB LED fan fin assembly designed, superb cooling performance. 120mm Fan with RGB LED. Heat Sink Material Aluminum (Fins). 1 x CPU Cooler. Fan Speed 1800RPM ± 10%. Compatibility - LGA 1155, LGA 1156. WHAT YOU SEE IN THE PICS IS EXACTLY WHAT YOU GET. 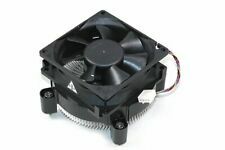 Titan DC-155A915Z/RPW 95mm Z-AXIS Low Profile CPU Cooler for. CPU Support . 1x CPU Heat Sink. Fan Size: 90 x 90 x 25mm. Fan Speed: 2400 ± 10% RPM. Product Size: 115 x 100 x 75mm. Finished Product Weight: 175g. We will try our best to reduce the risk of the custom duties. Power Interface: 3Pin. Type: CPU Cooler. 1 x CPU Cooler. Power: 12V DC. Silent fan with built-in solid state silent capacitor. Fan: 90x90x25mm. Fan Life: 50000 hrs. Fan Speed: 2000± 10%RPM. 1 CPU heat sink. Fan size:Approx. 90 × 90 × 25mm. Fan speed: 2400 ± 10% RPM. Finished product weight:Approx. Bare weight:Approx. Product Type: LFB-115-44. B rand new. Fan size: Approx. 90 mm x 90 mm x 25 mm / 3.54 inch x 3.54 inch x 0.98 inchFull size: approx. 90 mm x 90 mm x 65 mm / 3.54 inch x 3.54 inch x 2.56 inchSpeed: 2200 /- 10% RPMVoltage: 12V DCPower: up to 65 wNoise: 22 dBAMax. Wind: 48 CFMcolor ：BlueEffective heat dissipation, low noiseDuration of use: approximately 30000 hoursMaterial: Plastic, aluminumPackage includes:1 x CPU cooler fan1 x support Note: Light shooting and different displays may cause the color of the item in the picture a little different from the real thing. The measurement allowed error is /- 1-3cm. Brand Unbranded MPN Does not apply UPC 190268425735 EAN 190268425735 ISBN 190268425735. Pulled from HP Compaq Elite 8300 Core i7 Small Form Factor SFF Computer. Model: HP 628553-002. For use with or pulled from. CPU Socket Type: LGA 1155/ 1156/ 1150. Rated Current: 0.41A. Product pictures may not reflect the most recent product revision. Product Condition: New. The manufacturer seals on the item must still be intact. Trending at $9.23eBay determines this price through a machine learned model of the product's sale prices within the last 90 days. · Fin Pitch: 1.8 mm. · Fin thickness: 0.5 mm. · Fan size: 70x70x15mm (model# Delta AFB0712HHB). Sale Includes:1x Low Profile Cooler, no backplate. We take pride in our highly qualified crew with vast knowledge and experience with computers & electronics. OEM DELL CPU Heatsink Fan Stock Cooler for intel LGA1150 LGA1151 LGA1155 LGA1156. Condition is Used. Shipped with USPS Priority Mail. CPU Socket Type: LGA 1155/ 1156/ 1150. Heatsink Spec. Weight: 210.0 gFan Spec. Connector: 4pin. Rated Current: 0.41A. CPU Socket: LGA1151 / LGA1155 / LGA1156. Dynatron K6 Low power CPU cooling solution. 80x80x15 mm PWM blower with Aluminum heatsink for 1U Server up to TDP 55 Watts. Solution: 1U Server. Material: Aluminum 6061 Skived Fins. Material Aluminum Radial Fin Heatsink with Copper Inserted. Socket LGA1156, Core™ i3, Core™ i5 Processor I5-750 2.66GHz, Xeon® Processor 3400 Series up to 2.93GHz ; Core™ i7 Processors I7-800 Series up to 2.93GHz. Athlon 64 X2 3600 / 6400 (AM2). 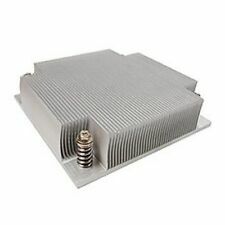 Heatsink Material: Aluminum Fin Heat-Pipe. Core 2 Duo Processor Socket T E4300-E8700. Core 2 Quad Processor Socket Q6600-Q9650. Core i7 (LGA 1366) Processor i7-920 970. Aluminum heat sink with PWM fan. 4-pin fan connector. New in box. CPU Heatsink and fan for LGA 1155 socket CPU. CPU Socket Type: LGA 1155/ 1156/ 1150. Rated Current: 0.2A. Product pictures may not reflect the most recent product revision. Product Condition: New. The manufacturer seals on the item must still be intact. Evercool HPKC-10025EA Universal Low Profile Quad Heatpipe CPU Cooler - Sockets 1156 / AM2/ AM2 / AM3. Athon 64 X2~3600 /~6400 (AM2). Core i5 Processor i5-750. Max CPU Cooler Height: 67 mm. Athon Penom II X2~550 / X3~720 / X4~965. LGA 1156/1155/1150/1151. Processor fan is blowing down to the heatsink on top of the CPU chip and at a closer distance for more effective direct cooling. has a height clearance of only 27.03mm to fit in mini ITX & 1U cases. Socket compatibility LGA1150, LGA1155, LGA1156. Model Noctua NF-A9x14 PWM. Depth (without fan) 95 mm. Depth (with fan) 95 mm. Screws for 92x92x25mm fans. SecuFirm2™ Mounting Kit. MTBF > 150.000 h. Input Power 2,52 W.
TheK1 features a solid aluminum skived heatsink for efficient heat dissipation. TheK1 passive heatsink is designed to be used in conjunction with chassis cooling; the 1U chassis must have active cooling, e.g., fans. 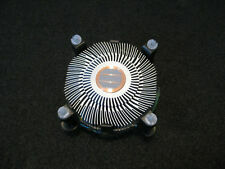 Genuine Dynatron Microfin Low Profile Heat Sink and Fan. Model # T459. (Socket LGA 1150. Clip for LGA 1150/1155/1156. Either one is pre-installed from the factory. It is easy to change out the clip). Heatpipe CPU Cooler. The 10cm fan provides more air flow than standard OEM fan with substantially lower noise. Clip for LGA 1156. Core i7 860,870. Core i5 Processor i5-750. New Heatpipe CPU Cooler. The 10cm fan provides more air flow than standard OEM fan with substantially lower noise. 4 heatpipes in 6mm and heatpipe direct touch Tech for maximum cooling efficiency. 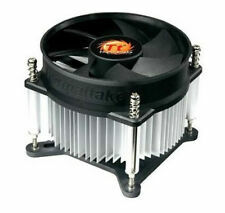 Dynatron K785 2U CPU Cooler 70mm Fan for Socket 1156 / Sandy Bridge LGA1155 CPUs 70mm Fan. Solution 2U & Up Server. Material Aluminum Extruded Radial Fin Heatsink with Copper Inserted. CPU Socket: 1155/1156. Condition is New(open box). Never been installed. AMD: AM2 & AM3. Selectable 1,600 or 2,000RPM fan allows you to select the cooling performance you want. Low-noise, low-vibration 120mm fan mounted on rubber studs. • PWM fan to adjust the power of the fan efficiently,enable HPQ-12025 to obtain both cooling performance and quietness. • Dual fan installed option provides increase the speed of heat conduction. DC Fan Size : 120 x 20 x 25 mm.